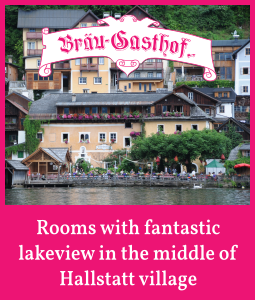 Hpliday in Hallstatt in Austria: Discover the beautilul landescape of the Echern Valley! 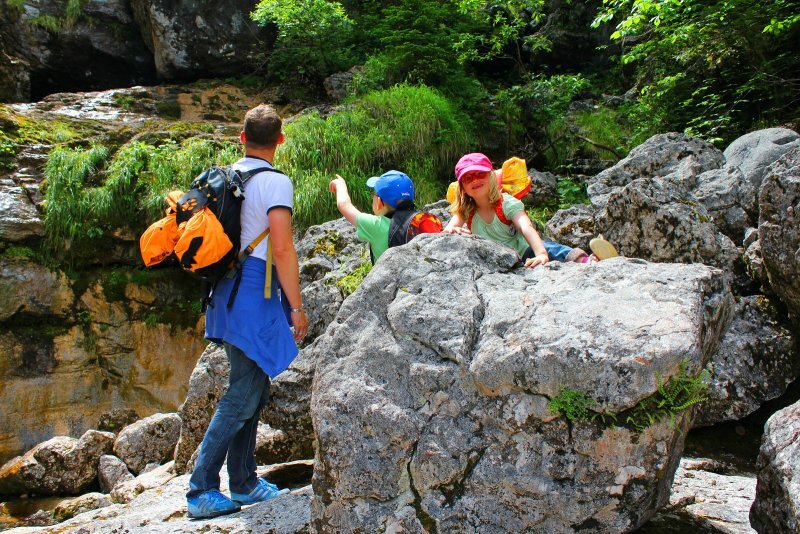 Hiking with the family: Echern valley in Hallstatt in Austria - © Kraft. 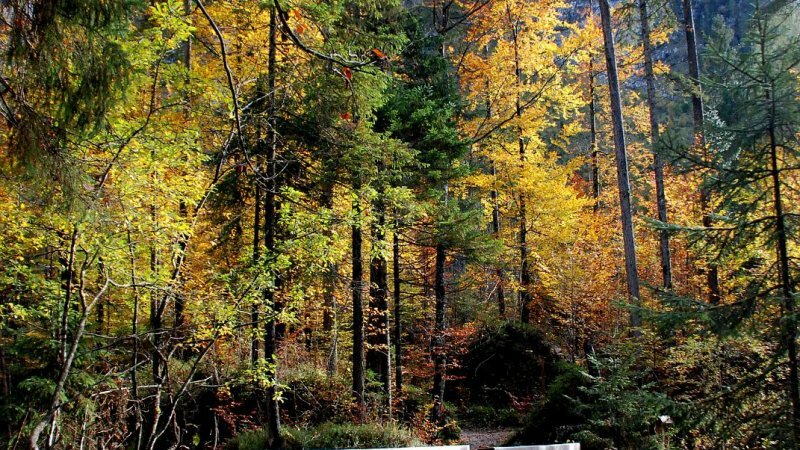 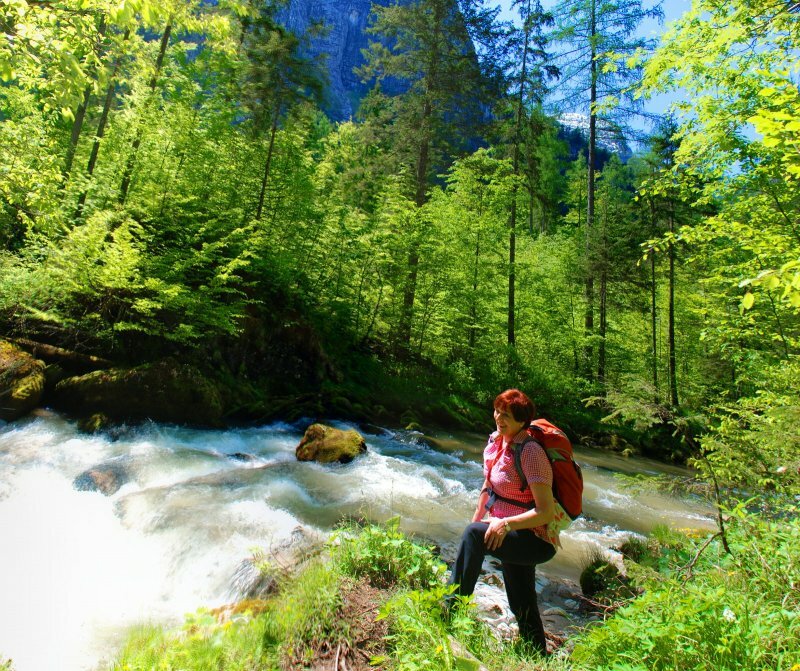 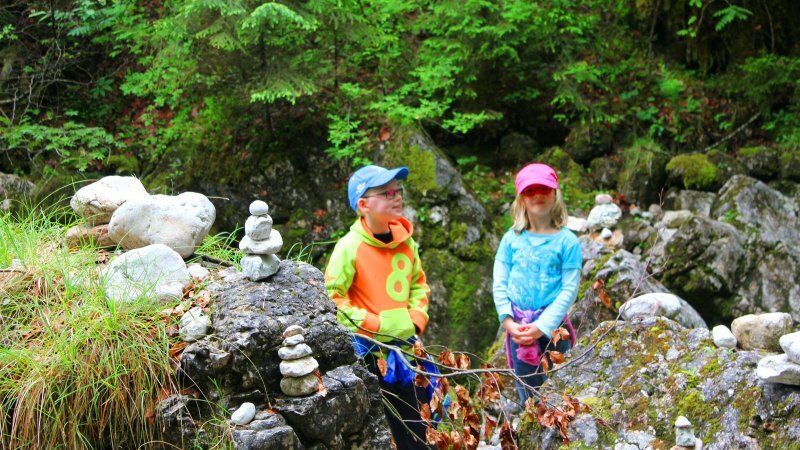 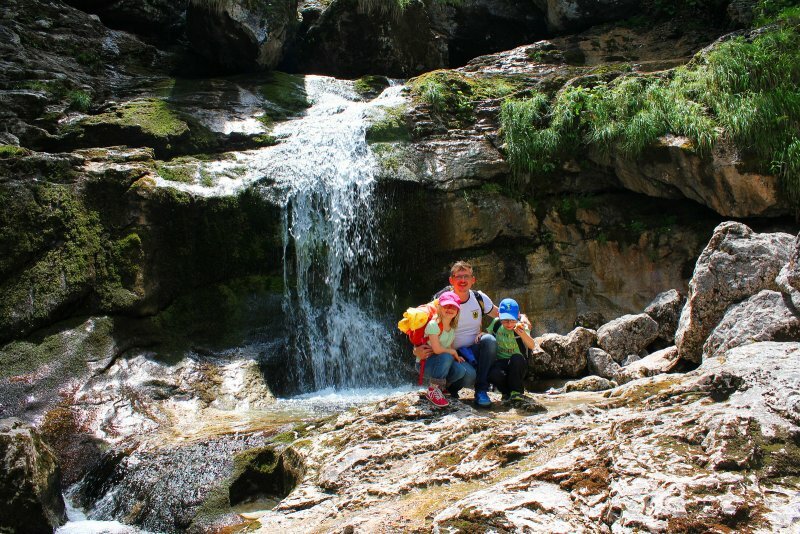 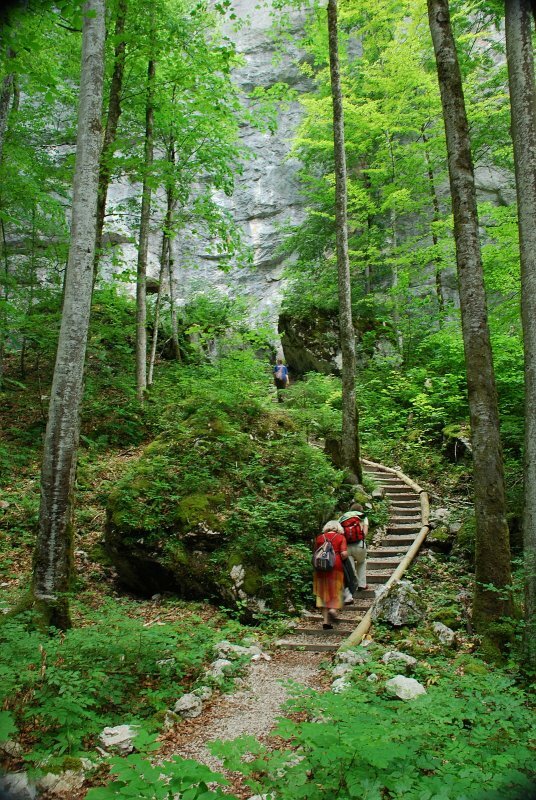 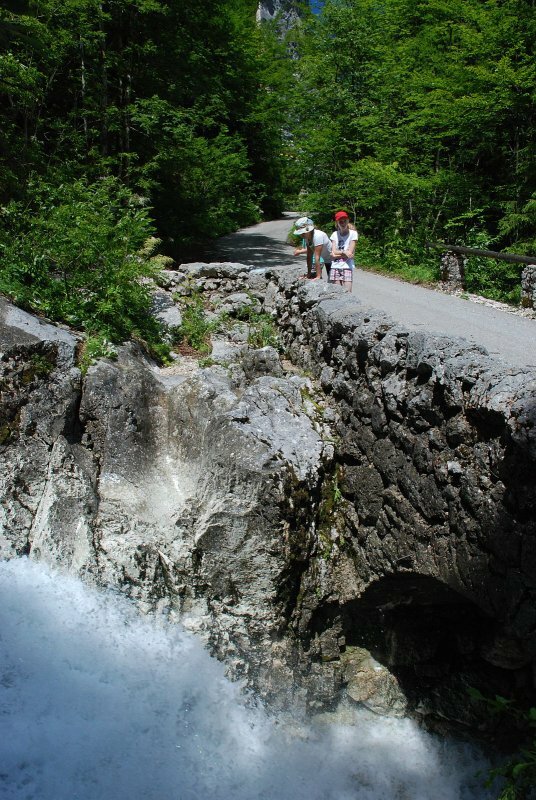 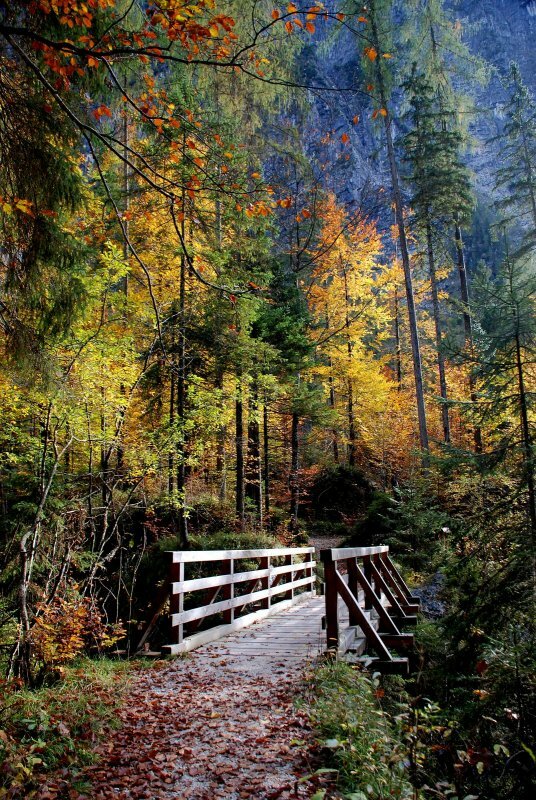 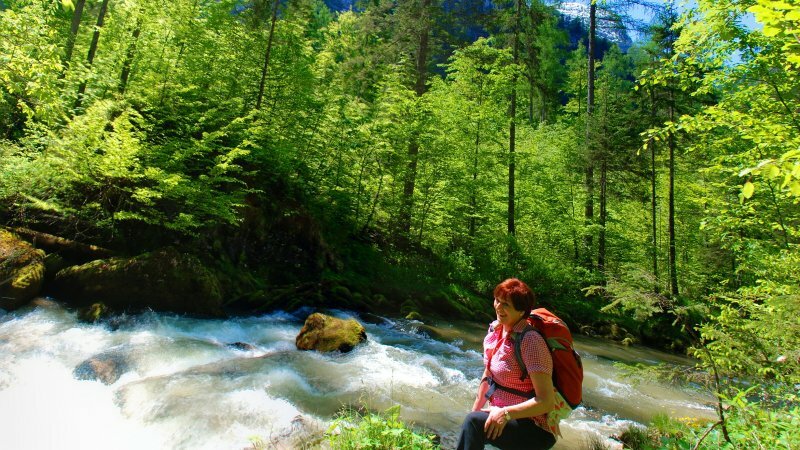 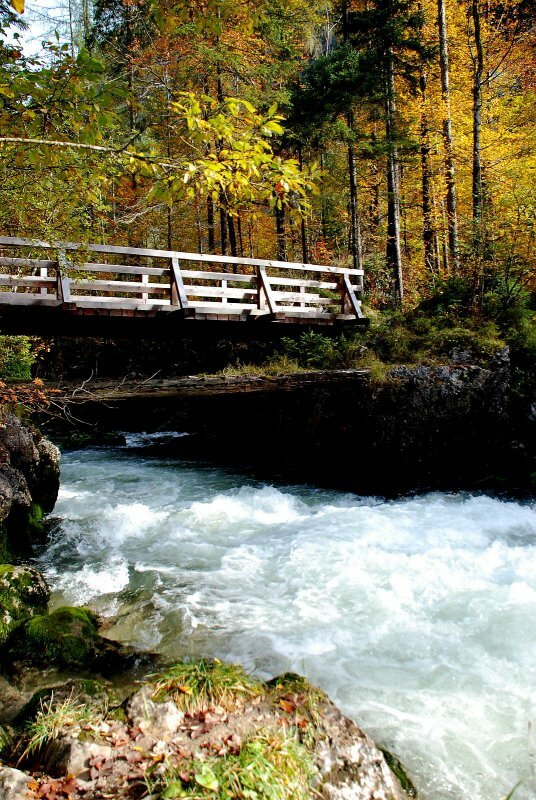 Hiking with the family: Echern valley in Hallstatt in Austria - © Mohr. 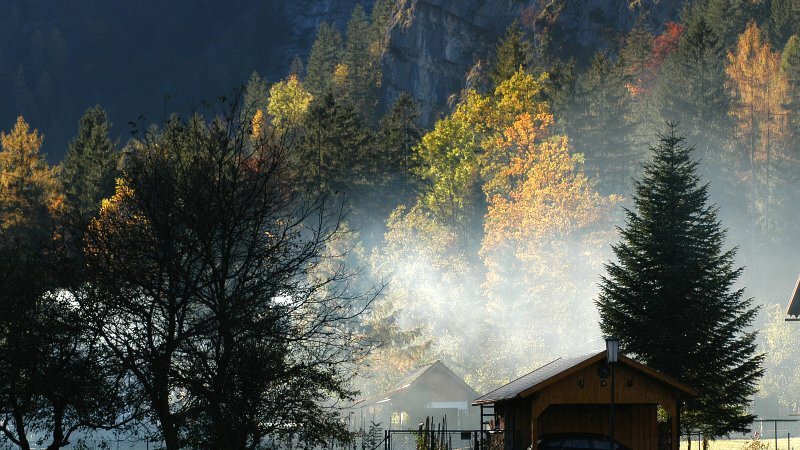 Glacier Garden of Hallstatt - © Kraft. 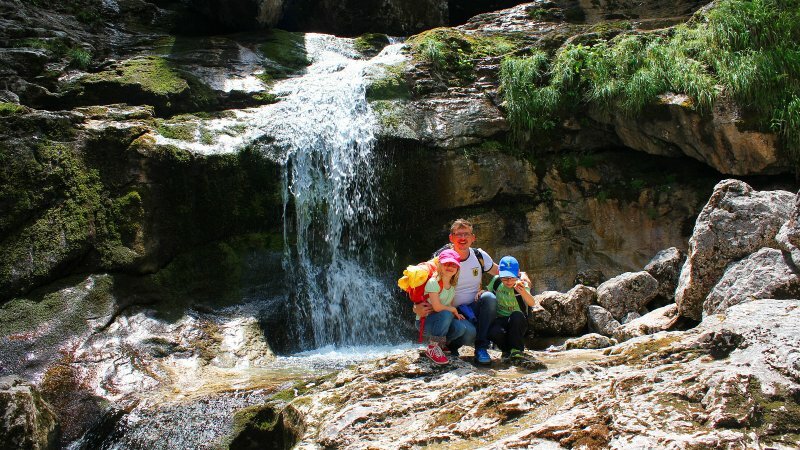 Holiday in Hallstatt / Austria: Impressions from the wild romantic Echern Valley (Echerntal) in the UNESCO World Heritage region of Hallstatt Dachstein Salzkammergut. 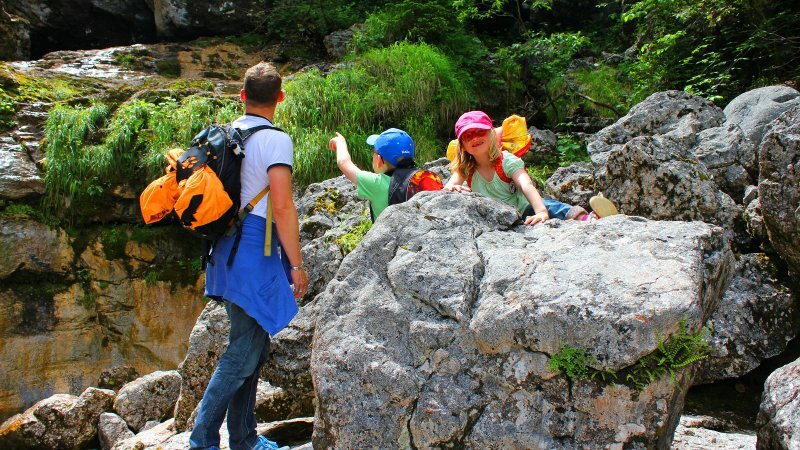 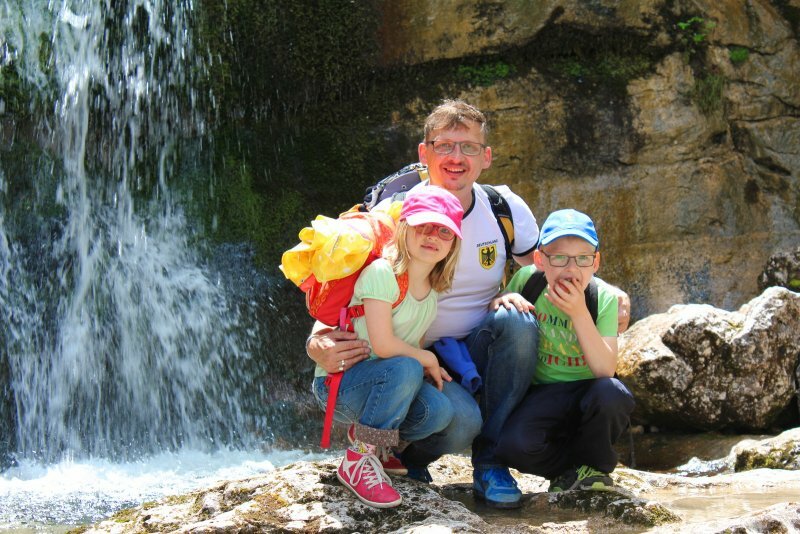 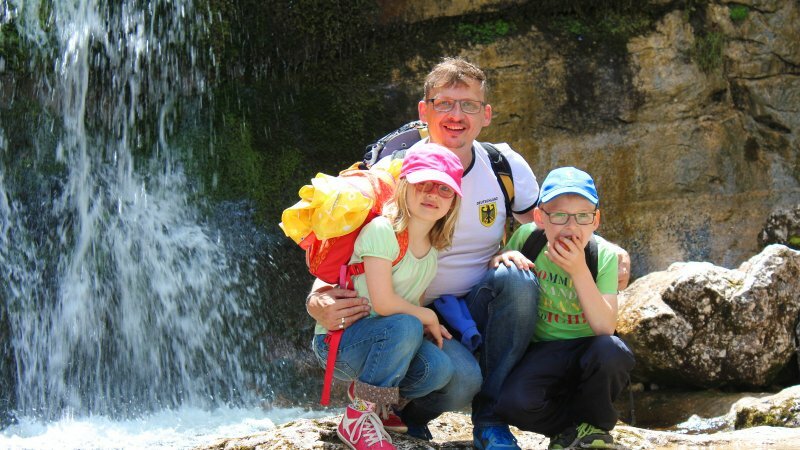 Hiking with the family: Echern valley in Hallstatt in Austria - © Singer. 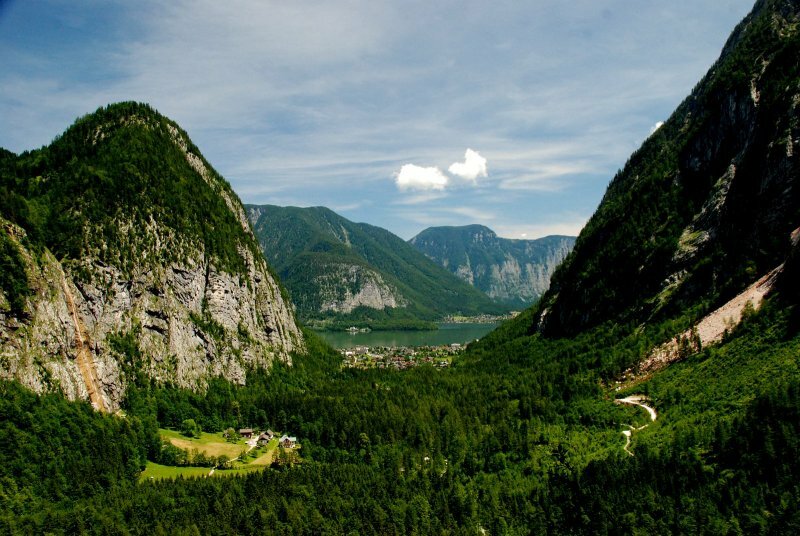 Unique Landscape: The Echern Valley in Hallstatt - © Kraft. 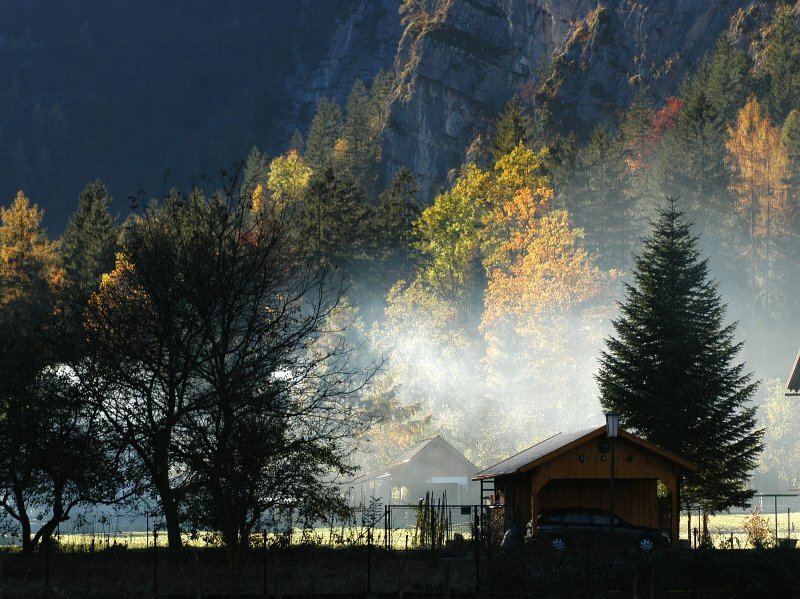 Discover the lanfscape of Hallstatt: Echern Valley - © Kraft. 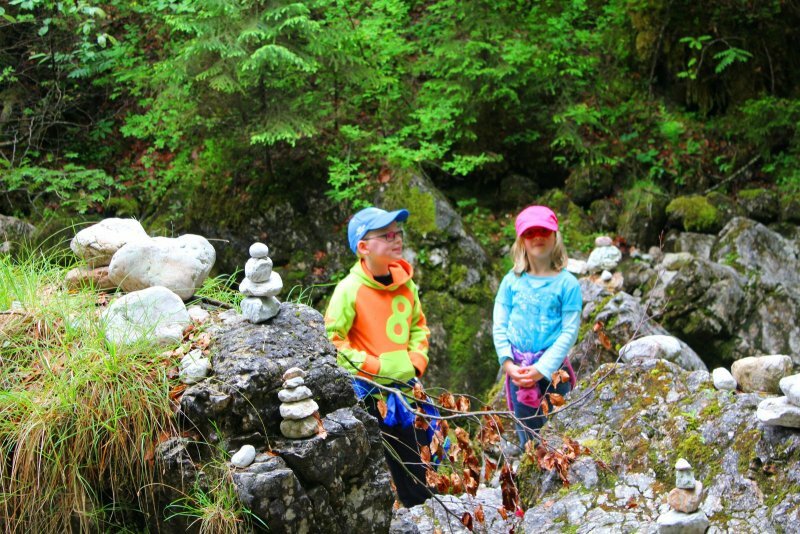 Holiday in Hallstatt / Austria: Impressions from the wild romantic Echern Valley (Echerntal) . 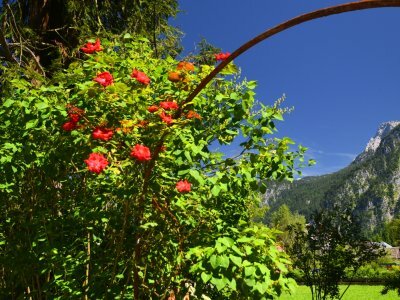 Holiday in Hallstatt / Austria: Impressions from the wild romantic Echern Valley (Echerntal) - © Kraft. 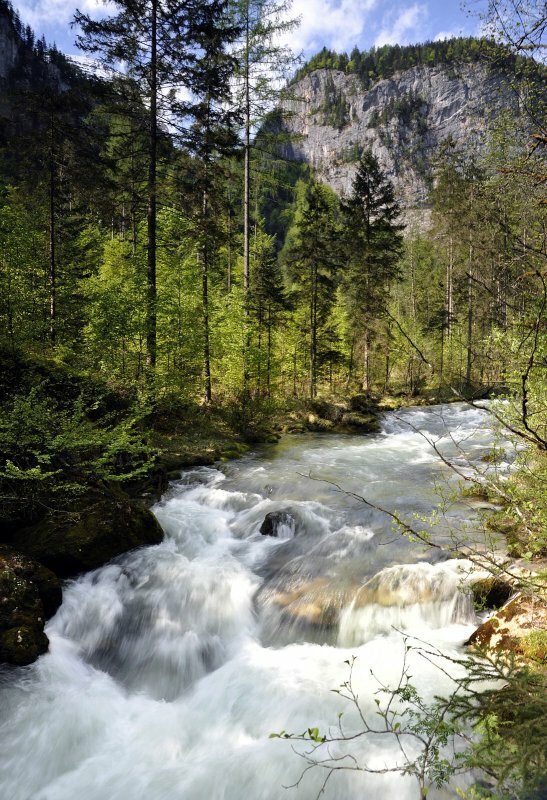 Impressions from the wild romantic Echern Valley (Echerntal) in the UNESCO World Heritage region of Hallstatt Dachstein Salzkammergut. 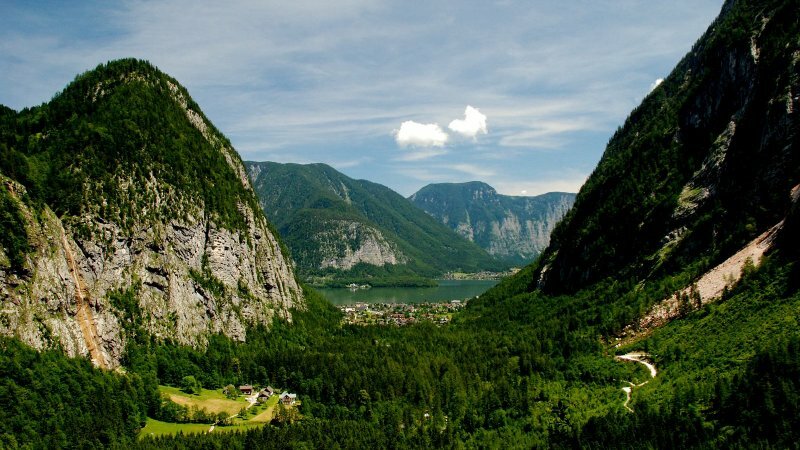 If you want to really breathe deeply, allow calm to overtake you or simply enjoy a discovery adventure with the family, then there’s nothing better than the romantic Echern Valley in Hallstatt. 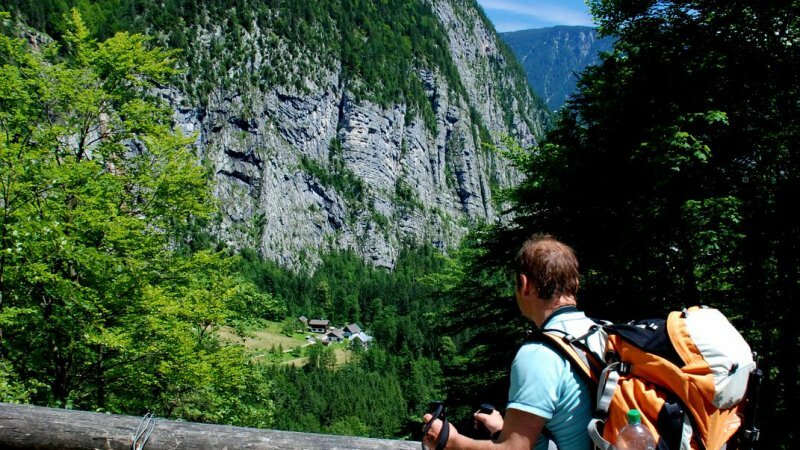 Far away from the hectic tourist zone, the charm of this narrow valley between the powerful Hirlatz Mountain and the steep Echern Wall stems from the many sights that it has to offer. 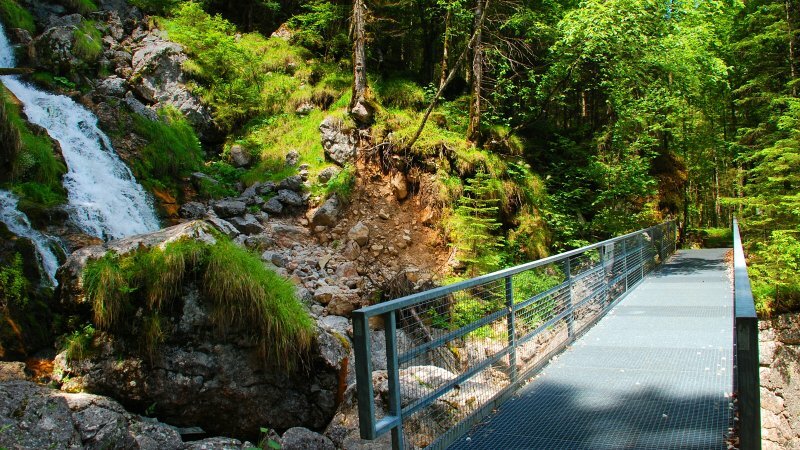 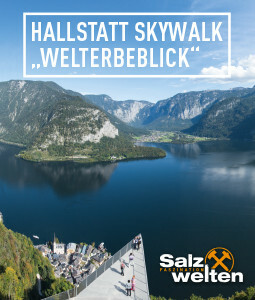 The extraordinary Glacier Garden (Gletschergarten) with its monuments from the last Ice Age and the majestic Waldbachstrub Waterfall count as two of the most beautiful destinations during a visit to Hallstatt in the UNESCO World Heritage Region of Hallstatt Dachstein Salzkammergut. 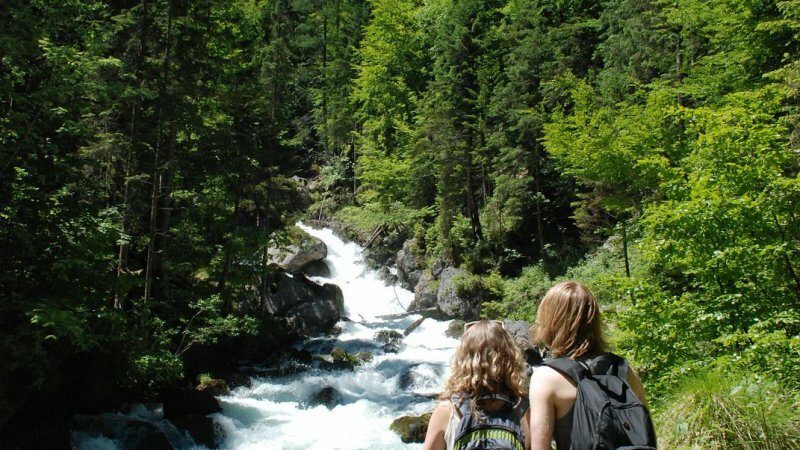 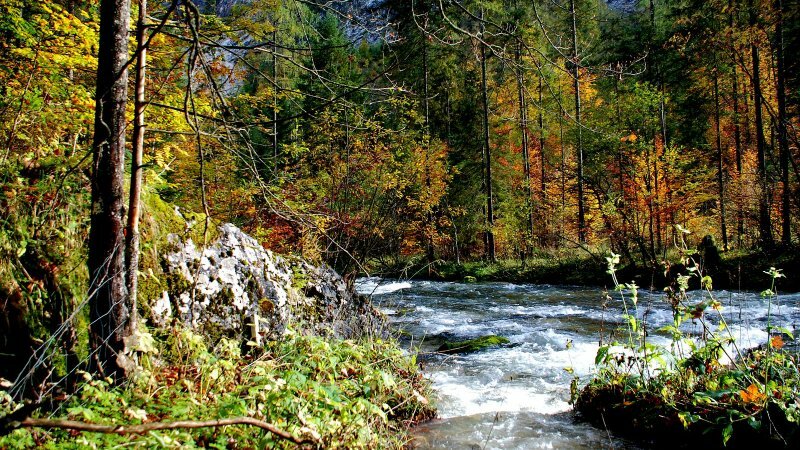 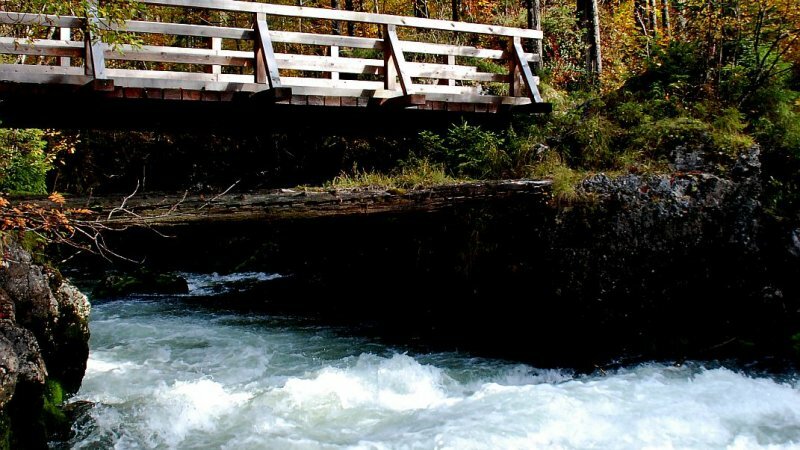 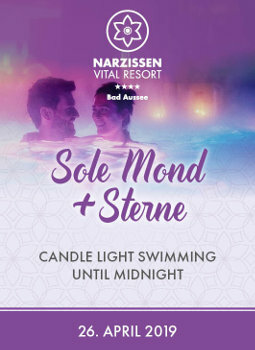 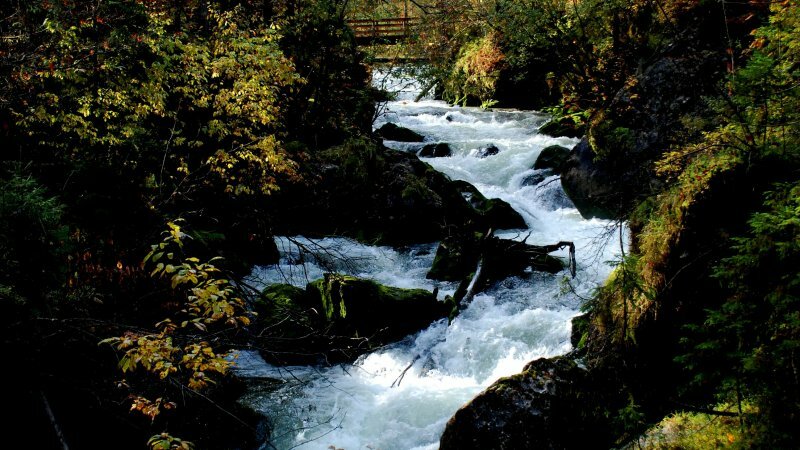 However, you need to allow plenty of time; the Echern Valley is not for short-term tourists in a hurry but rather something for true nature enthusiasts! 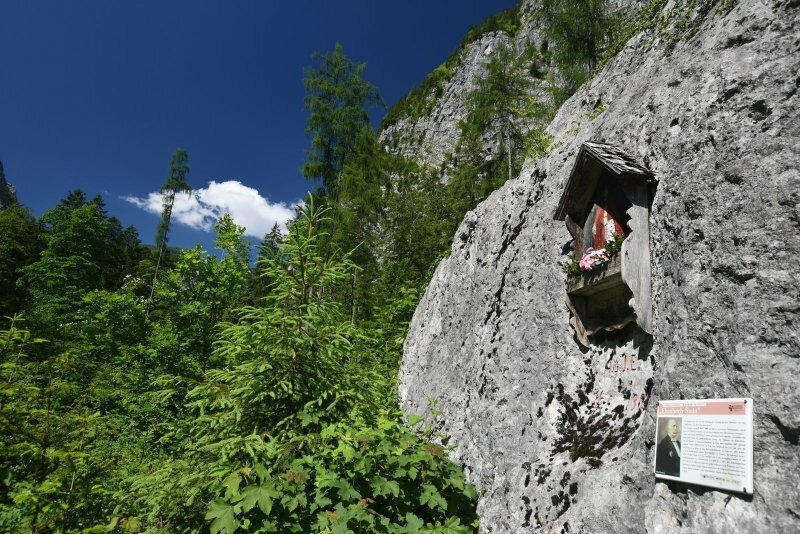 In the nineteenth century, numerous painters and writers took inspiration from this impressive landscape at the foot of the Dachstein. 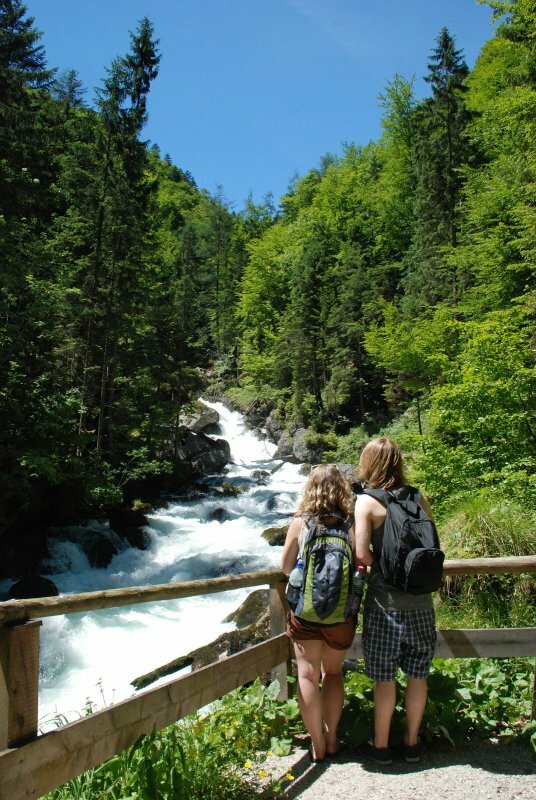 We strongly recommend sturdy footwear for the approximately three to four hour tour (dependent on the length of stops at sights). 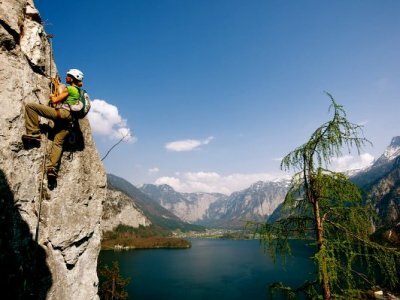 This time belongs to you! 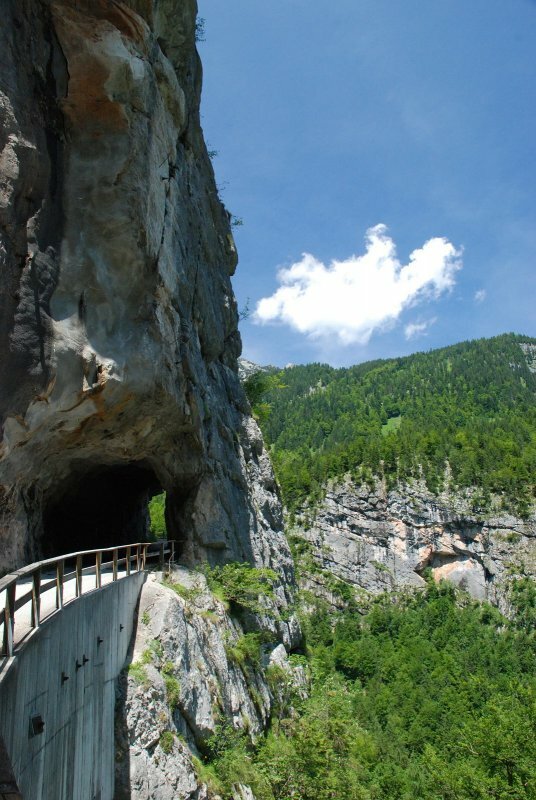 Detailed descriptions of the particular sights to follow. 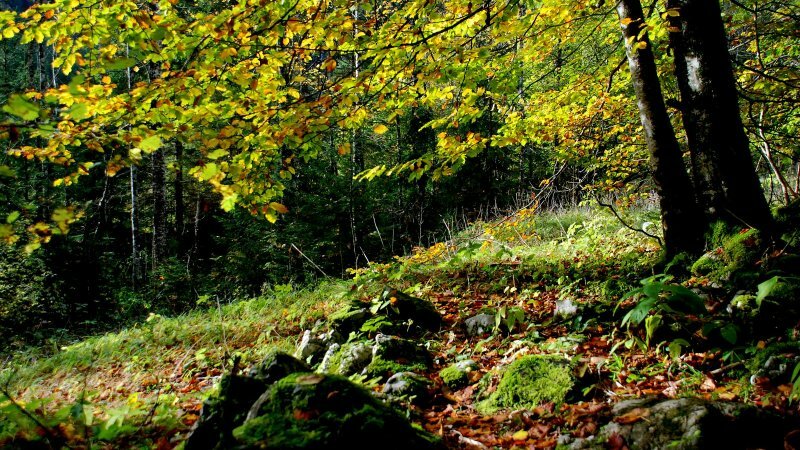 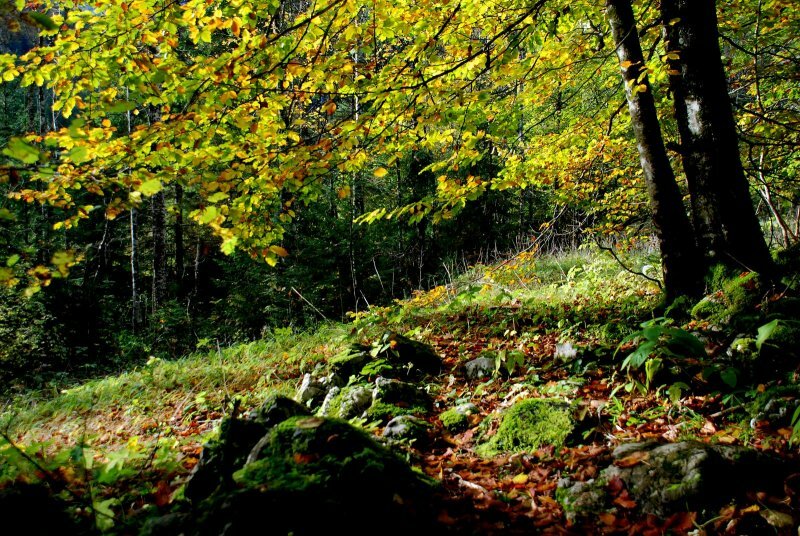 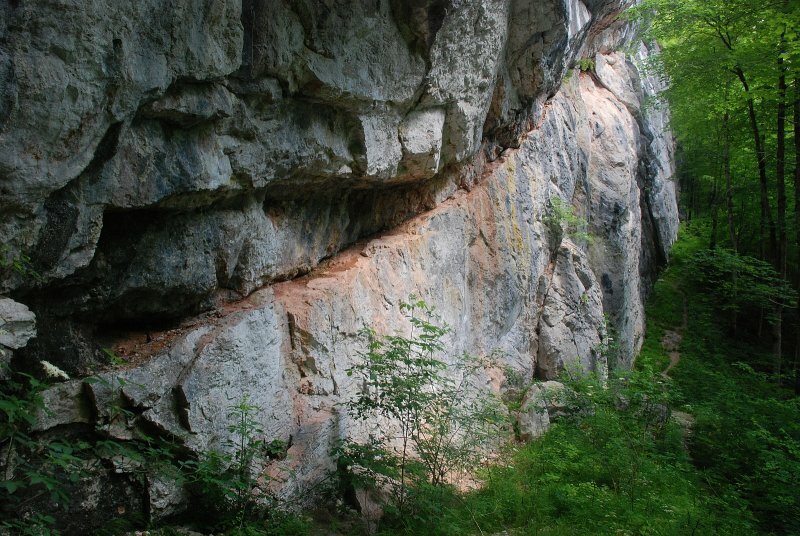 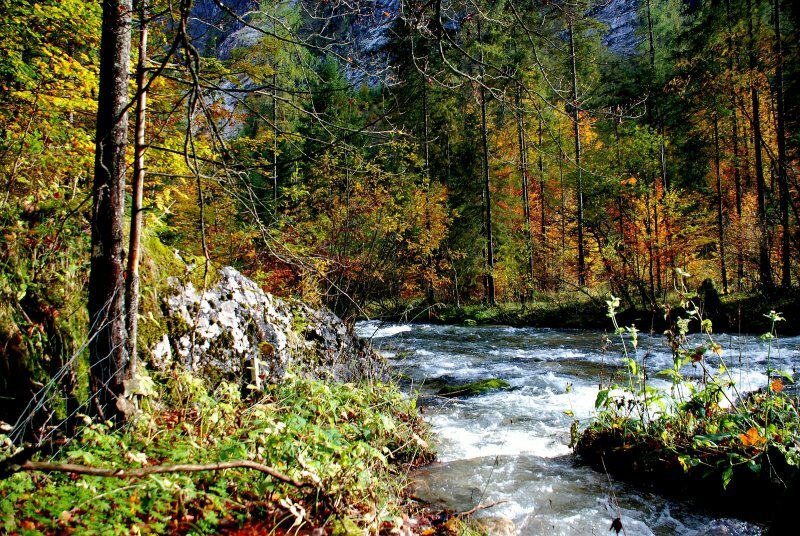 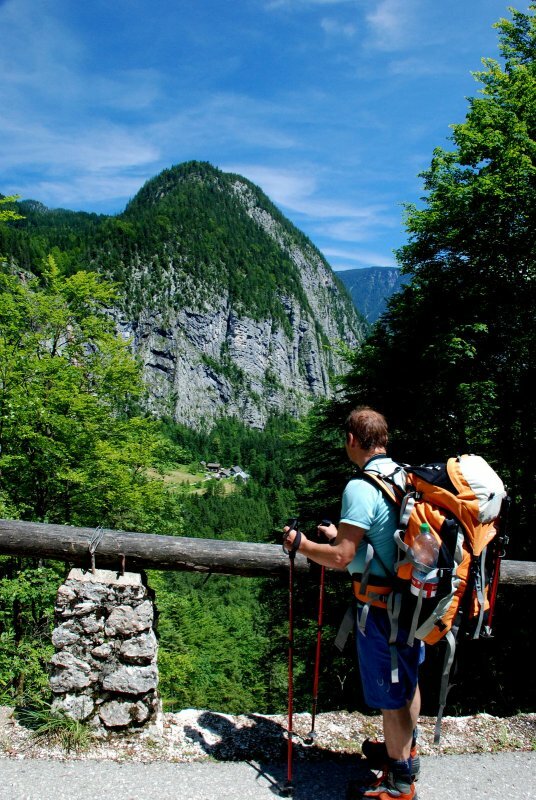 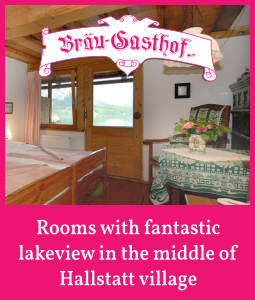 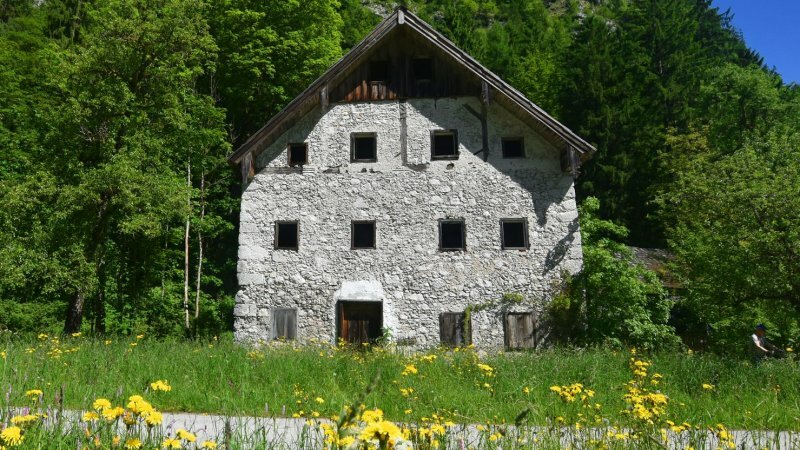 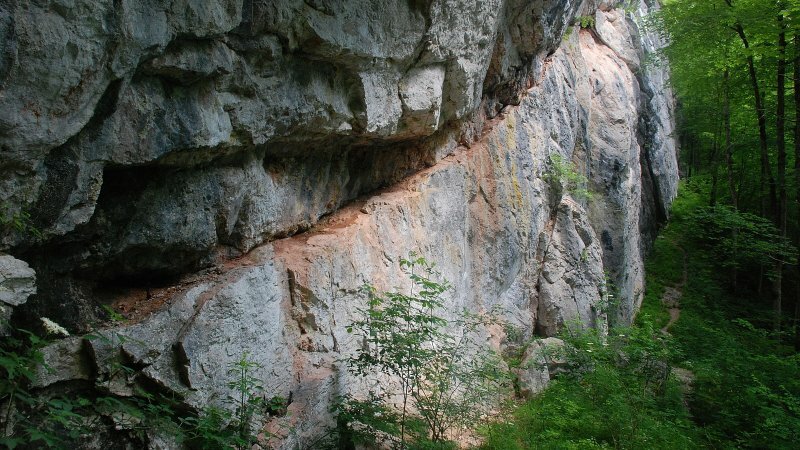 We hope you enjoy your personal discovery of the Echern Valley in Hallstatt. 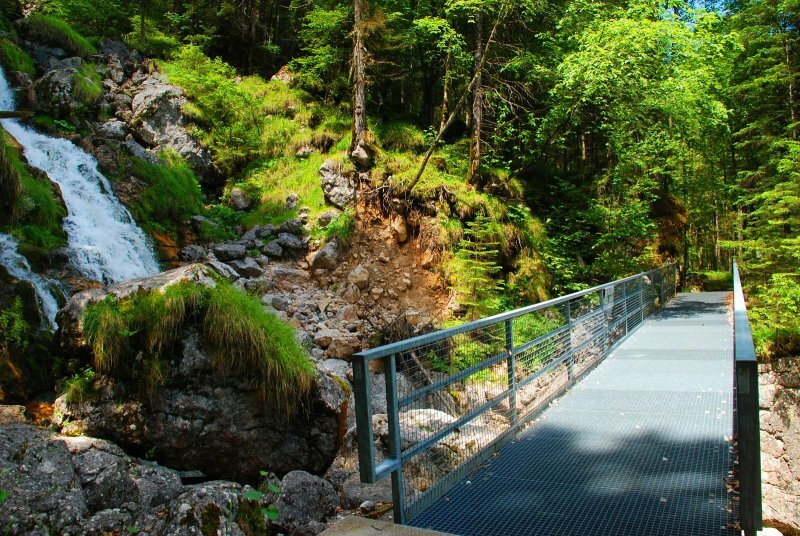 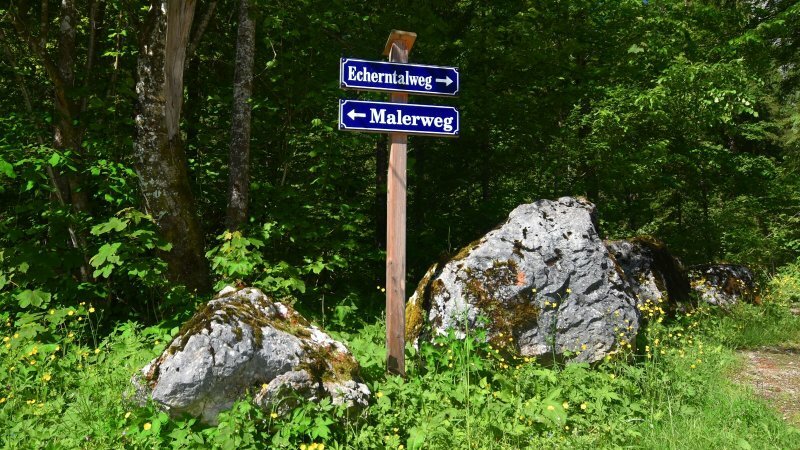 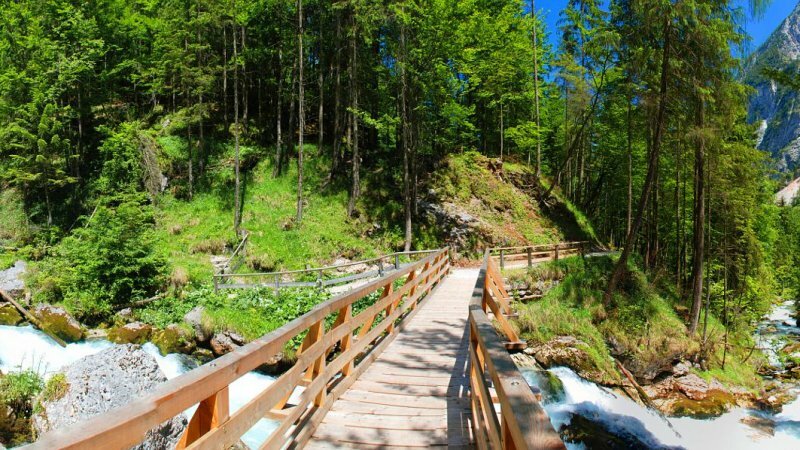 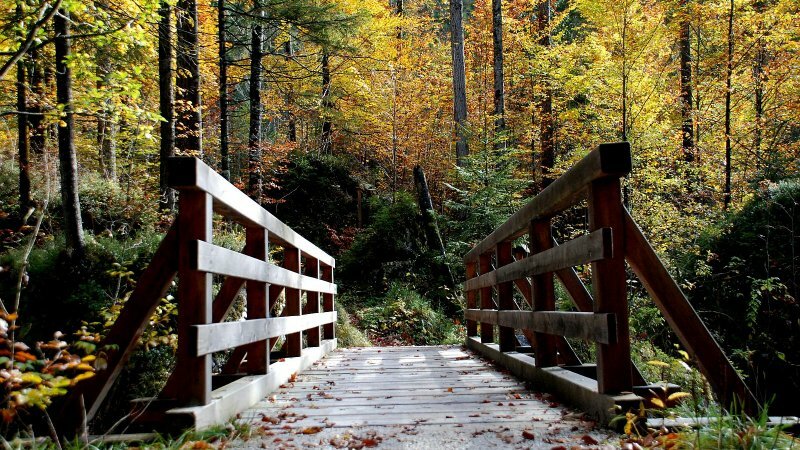 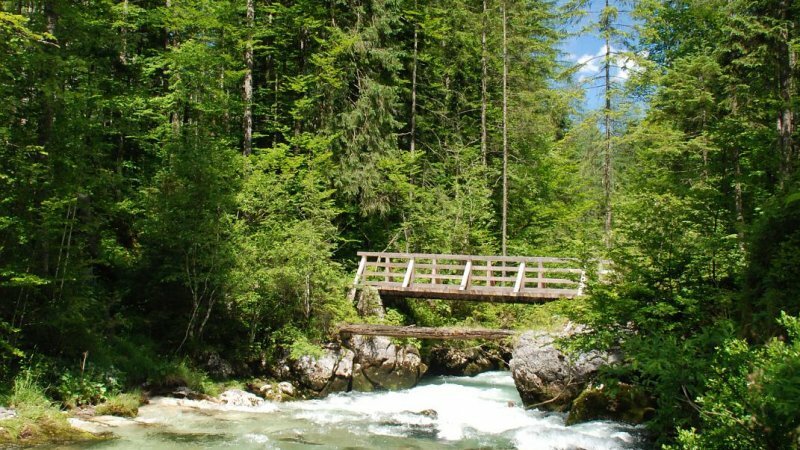 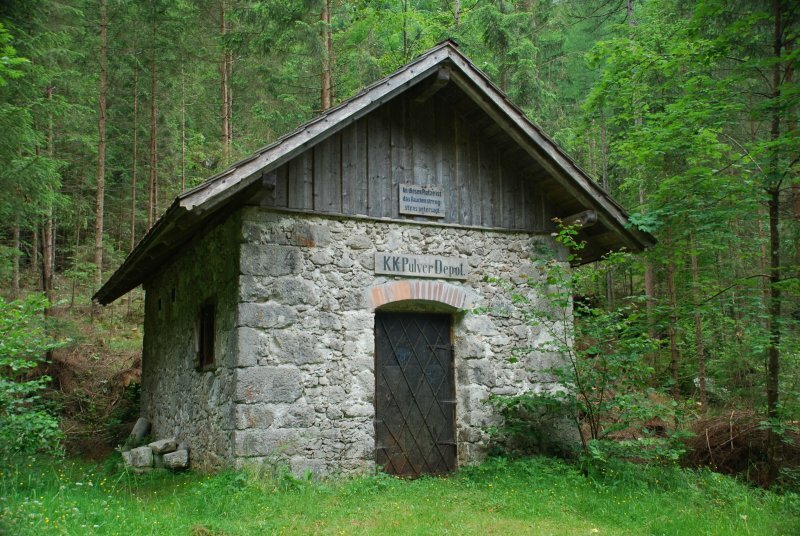 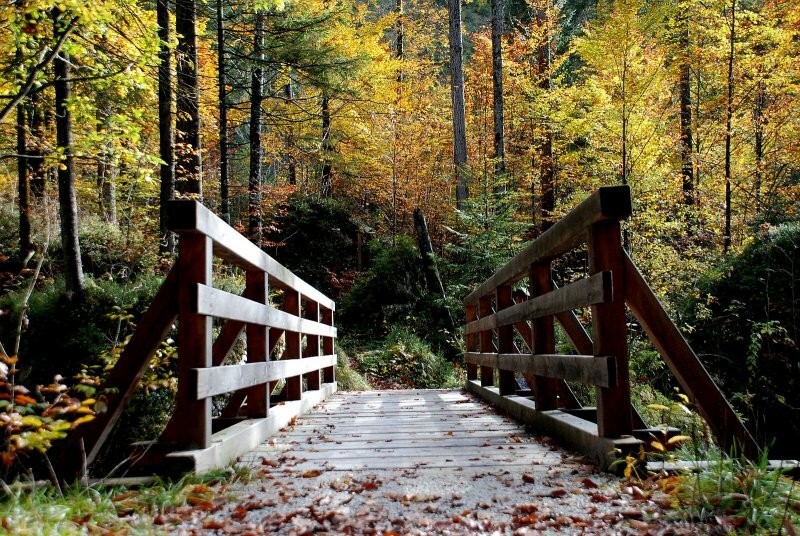 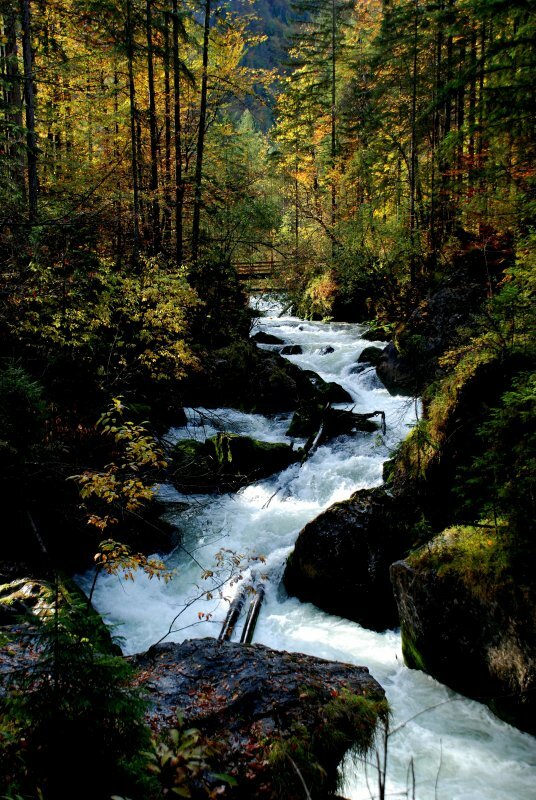 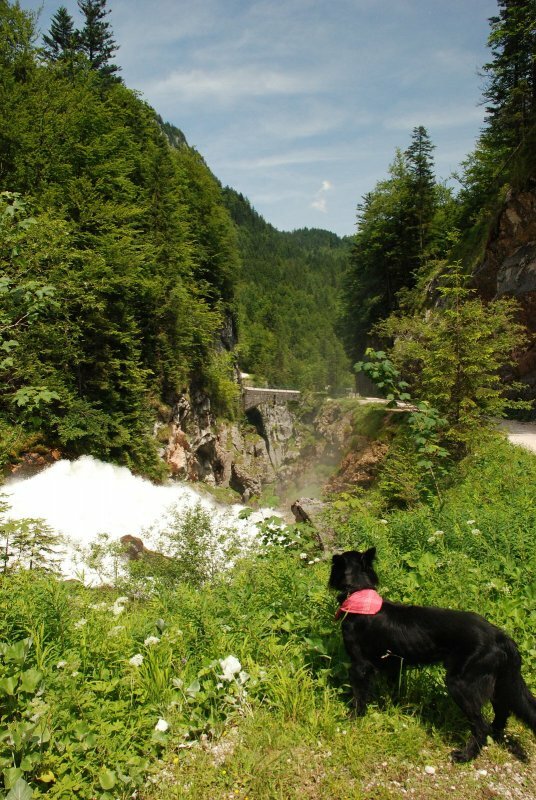 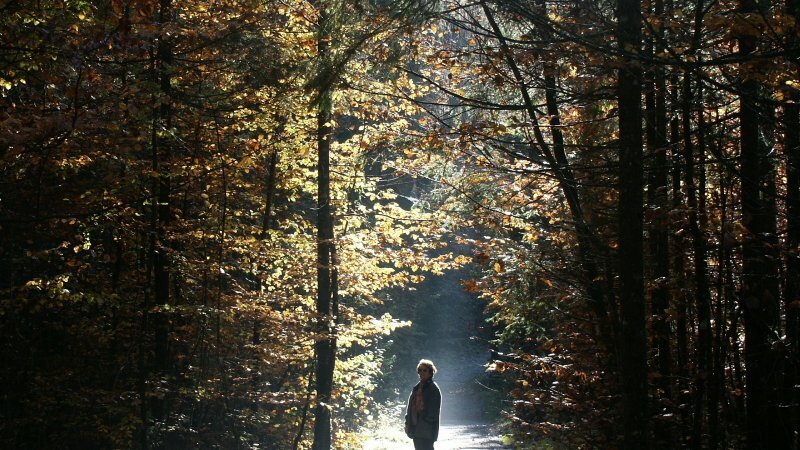 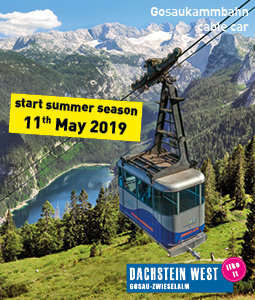 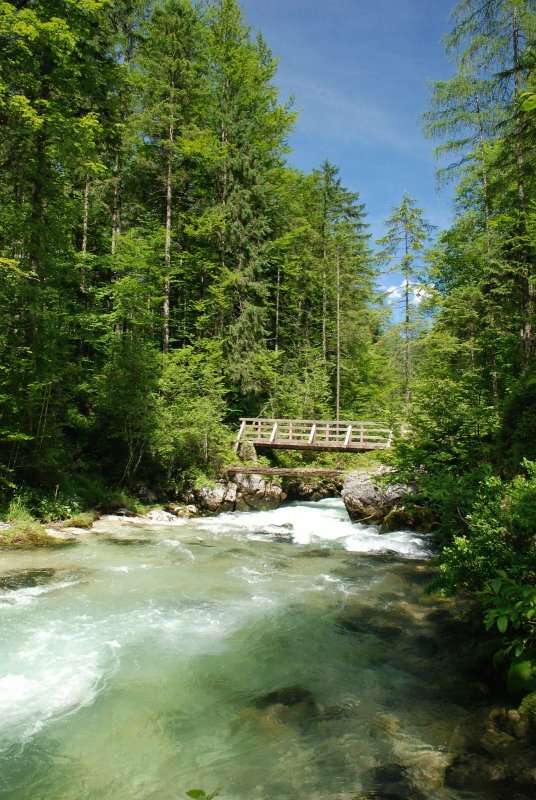 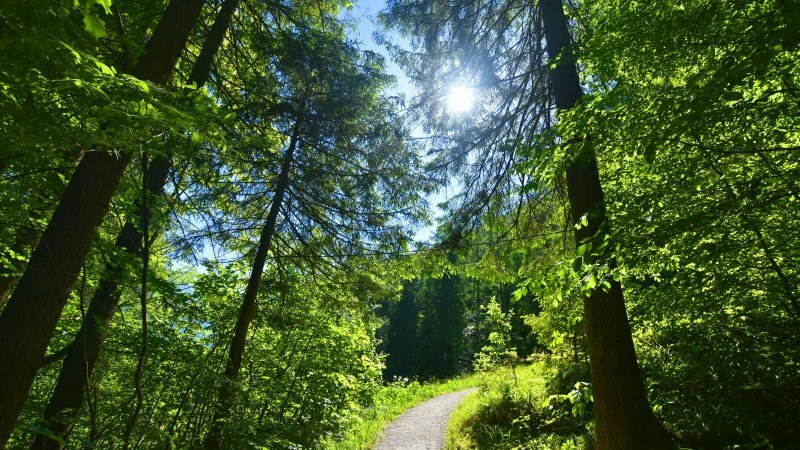 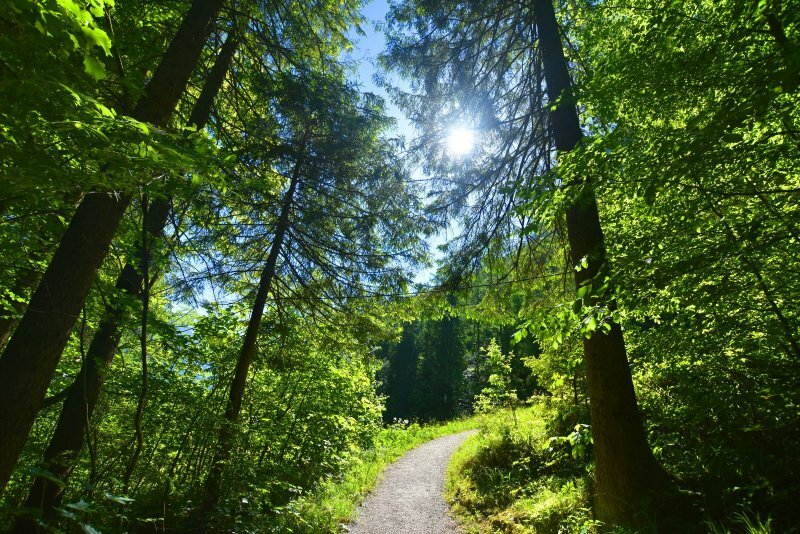 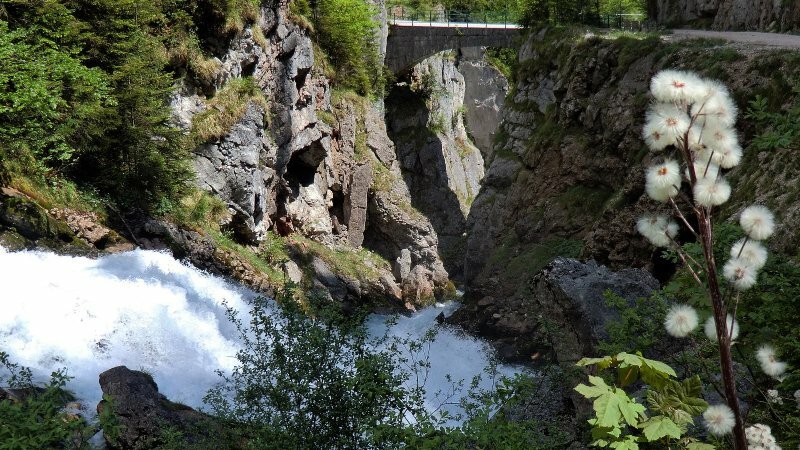 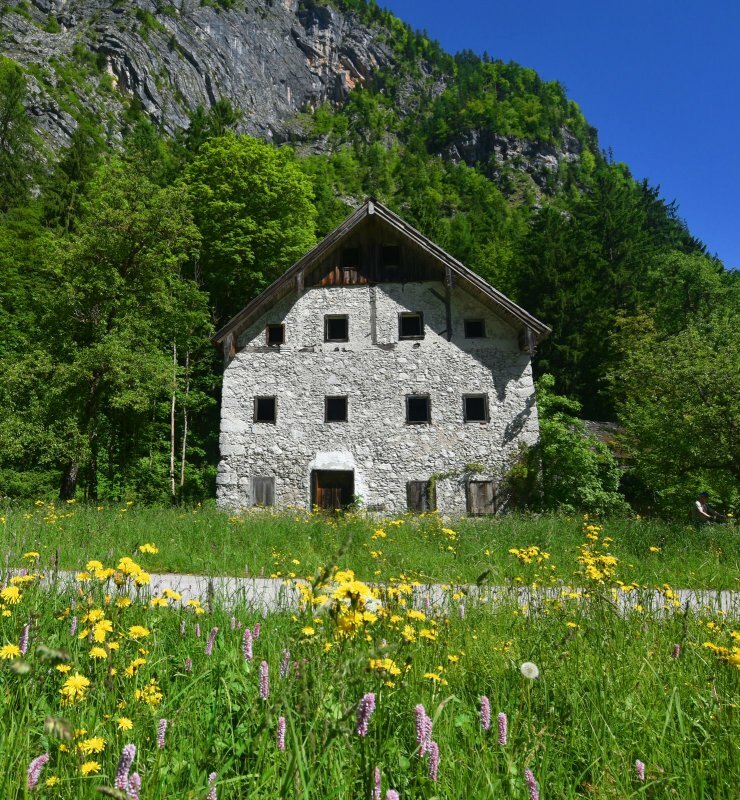 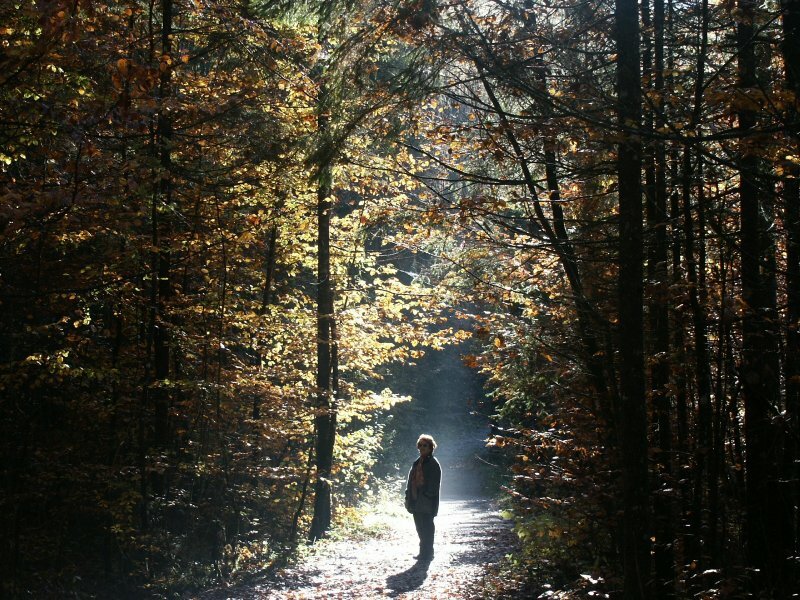 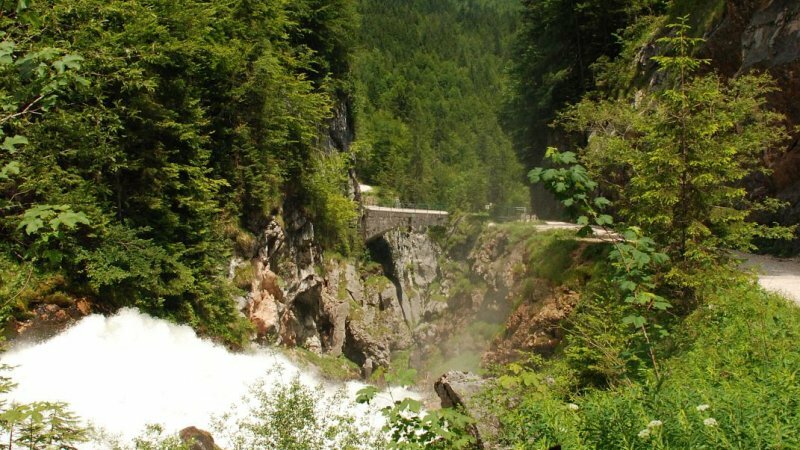 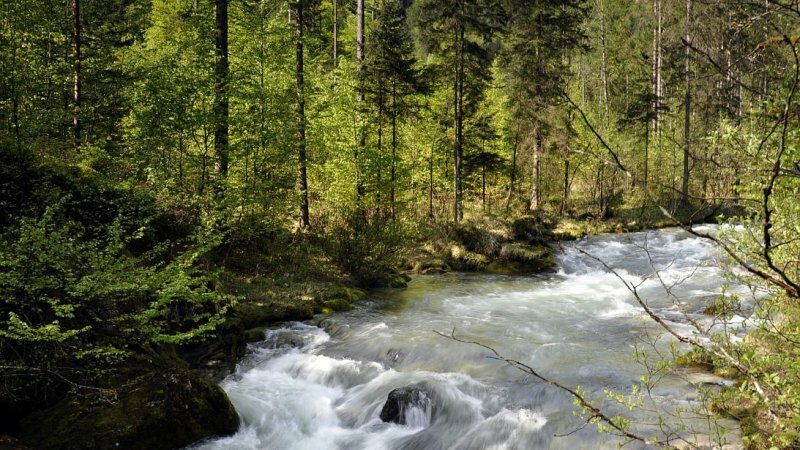 Our tip: Via the Echerntalweg (begins at car park P2 near the Salzberg funicular) to the Waldbachstrub Waterfall, continue to the Glacier Garden (Gletschergarten) and then return via the lovely Malerweg, Brandbachweg and Grabfeldweg to the Kalvarienberg Church (car park P1). 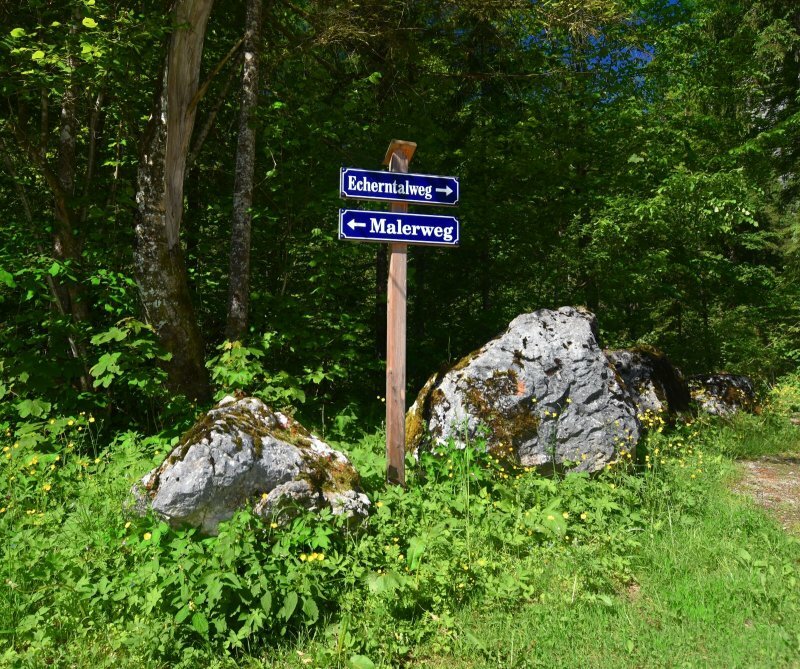 All paths are clearly marked! 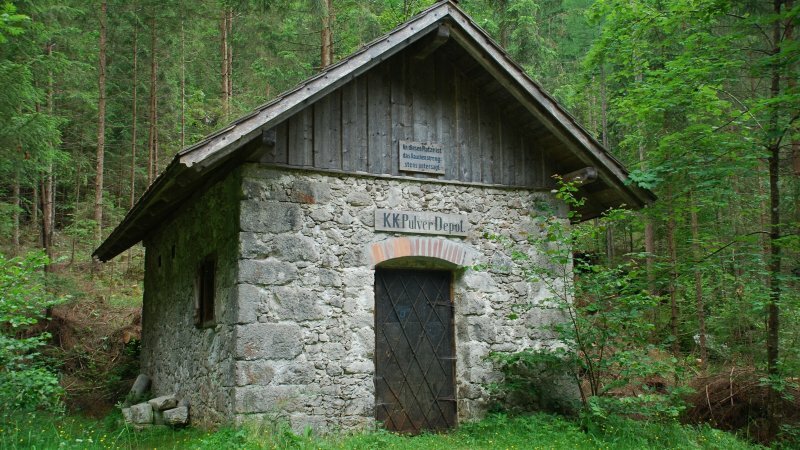 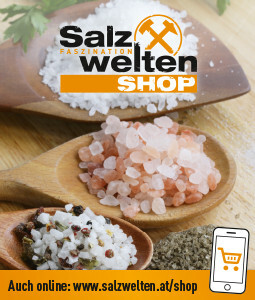 Geschichten rund um kuriose Kleinigkeiten am Wegesrand. 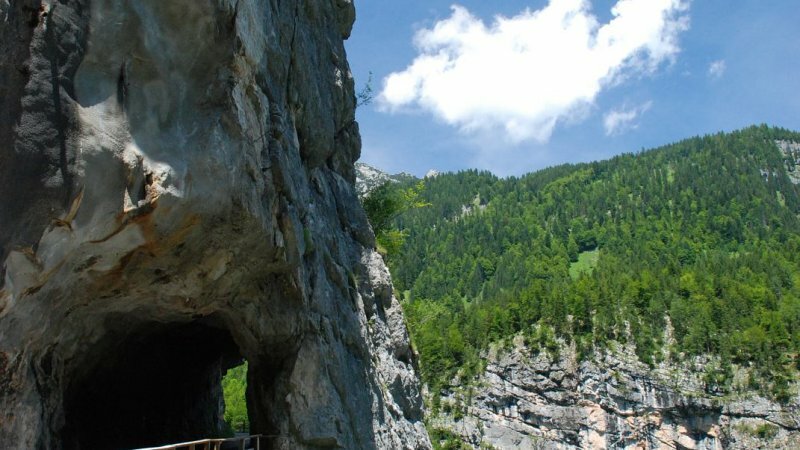 Erfahren Sie mehr über Land & Leute und die kleinen Geschichten rechts und links vom Wegesrand. Hallstatt | A hike possible for all and in all seasons. 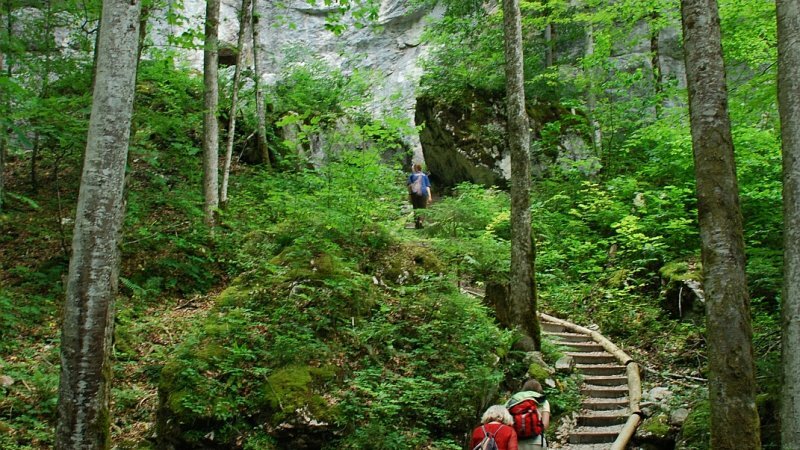 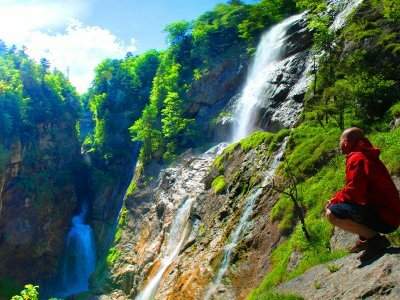 The spectacular view puts a spell on all hikers. 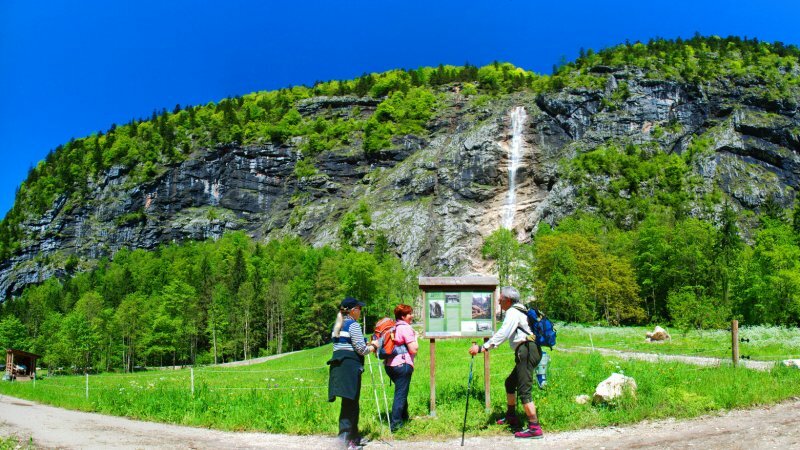 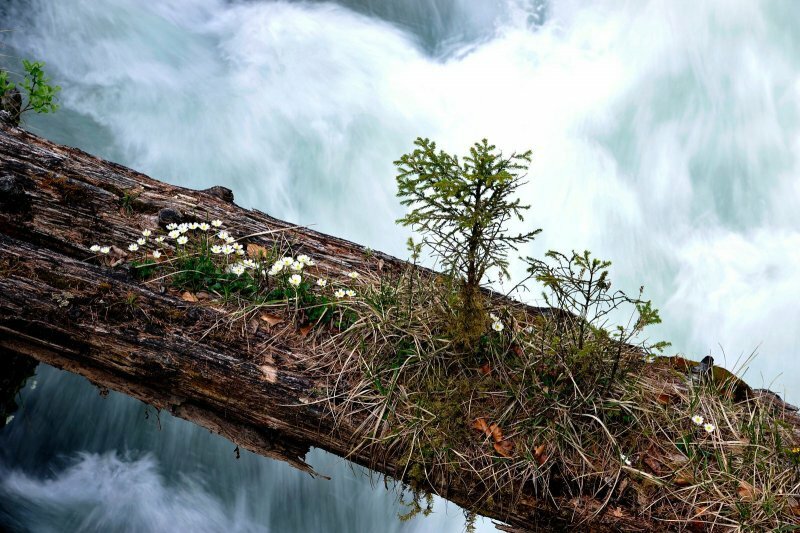 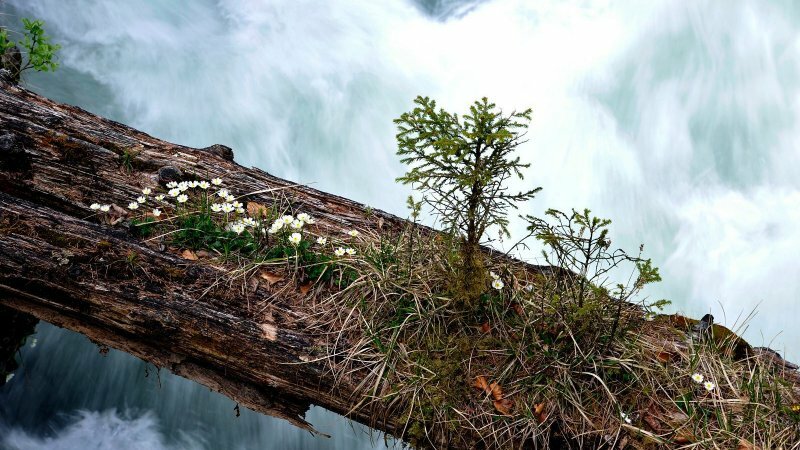 The Goal: The breathtaking Waldbackstrub Waterfall. 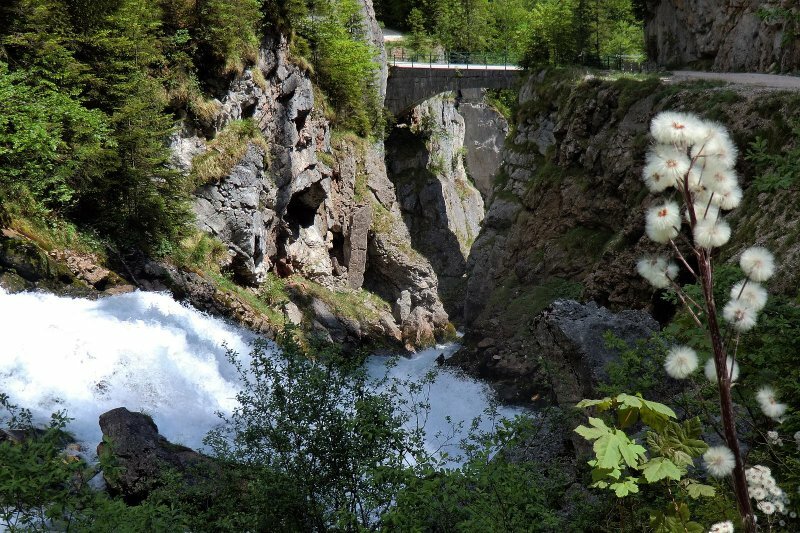 Hallstatt | Waldbachstrub: Impressive waterfall in the romantic Hallstatt Echerntal. 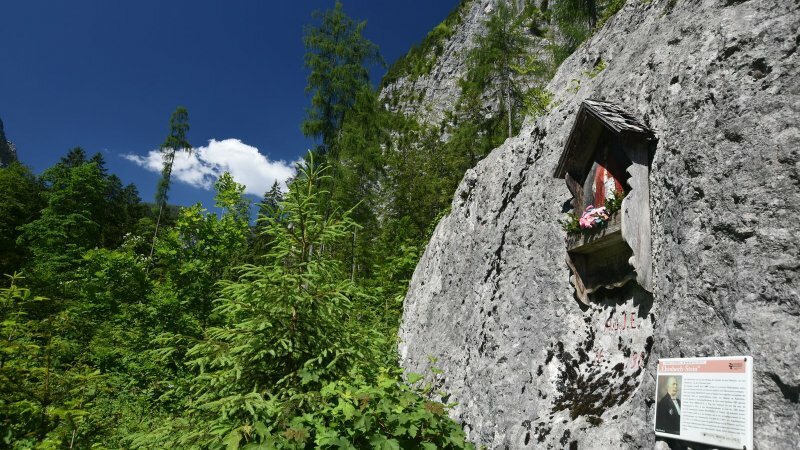 ‘Glücksplatz’ with cult status!